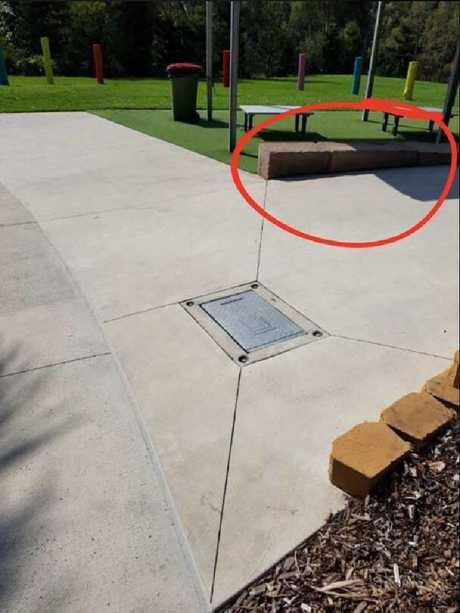 A MOTHER has told of the distress of seeing her 18-month-old girl sustain second degree burns to the bottom of her feet at a park in Ipswich. 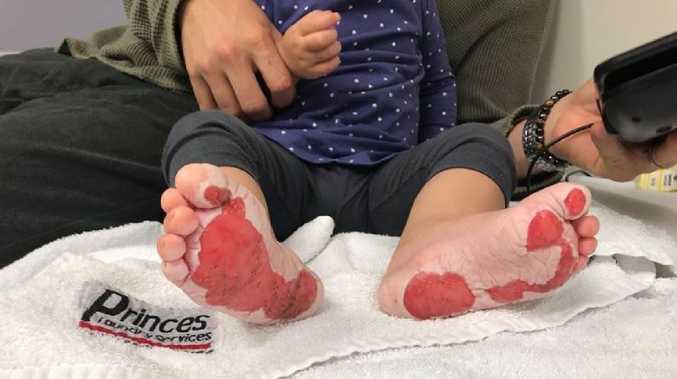 Simone Pickering has posted several photos of the horrific injuries her daughter suffered after stepping barefoot onto a metal plate at River Heart Parklands alongside the Bremer River. The plate had been covering a service pit. Ms Pickering said her daughter became so overcome with pain that she couldn't move off the metal cover. The child's injuries required surgery. "Our daughter just happened to walk a short distance from where myself and family were sitting to find herself paralysed standing on one of these scorching HOT metal plates unable to move due to the intensity of the heat below," she wrote on her Facebook page. "In seconds the damage had been done! Ms Pickering said she was sitting near the area circled when her child stood on the plate. "We instinctively tried to get her feet into cool water only to have her hysterically screaming and needing extra care. This was NO minor incident. "The drive to the hospital was the most horrific heartbreaking 10 minutes of my life to date." Ms Pickering did not expect the metal plate to be sizzling because it was not a "cracking hot day" and only a "25-28 degree day". The Ipswich City Council said in a statement that it was contacted last Thursday about the incident and have since erected a safety barrier around the pit cover. "Water parks will always need service pits and as this one is not located in the immediate vicinity of the water play area, it may not have been identified as a potential hazard in safety audits," the statement read. "The pit cover has since been coated with a heavy paving paint that has reduced its temperature. "As an additional measure inspections have been carried out in other water parks for potentially similar situations. "Council urges parents of young children to be mindful of the risk of all exposed surfaces being hot during summer." 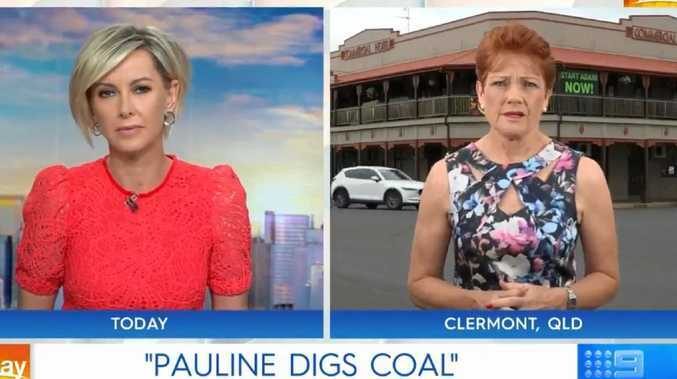 Ms Pickering said the images of her child's scorched feet were embedded in her mind and said she was "angry" in many ways that her daughter suffered the injury because of "negligence of our local council and the engineers". The park opened in 2007 and includes two large water features, viewing platforms and barbecues.